My inordinate interest in the Robert Kissel murder case continues anew after finishing Never Enough last night. Since the Hong Kong media has been banned from reporting on the new trial's proceedings, I shall have to get my milkshake murder fix elsewhere. 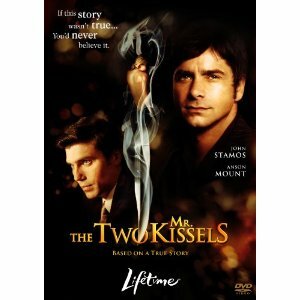 And of all the random Kissel-associated media I found... John Stamos produced a Lifetime movie about the case? It's called The Two Mr Kissels. Yay for crappy movie titles that don't really mean anything. Stamos stars as Robert's brother Andrew, also murdered not long after Robert in a sensational manner, while Robin Tunney does the honours as Nancy Kissel. Who would've thought, Uncle Jesse and that girl from Empire Records. Anyway, I'm buying it now off Amazon since I have no hope of finding it in my dodgy DVD store. If you want to borrow it, let me know. Also on the list of Kissel-related items with bad titles -- A Family Cursed: The Kissel Dynasty, a Gilded Fortune, and Two Brutal Murders. I want to get it too but there isn't a Kindle version and I'm not sure I should spend any more money chasing the truth behind this scandalous killing.